Happy Friday! Today is a two-for-one recipe. From last week's menu, one of the few dishes I had yet to try was the creamed spinach recipe from One Perfect Bite. 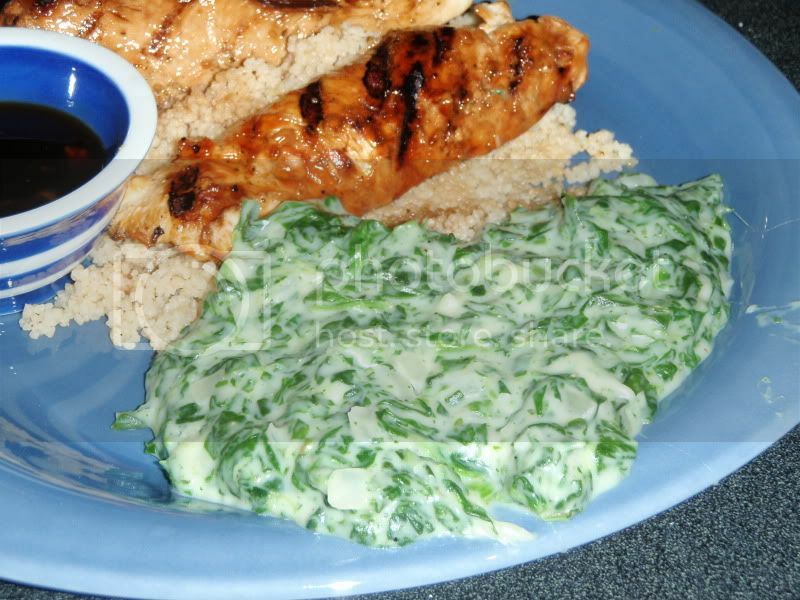 But you can't have creamed spinach by itself, now can you? 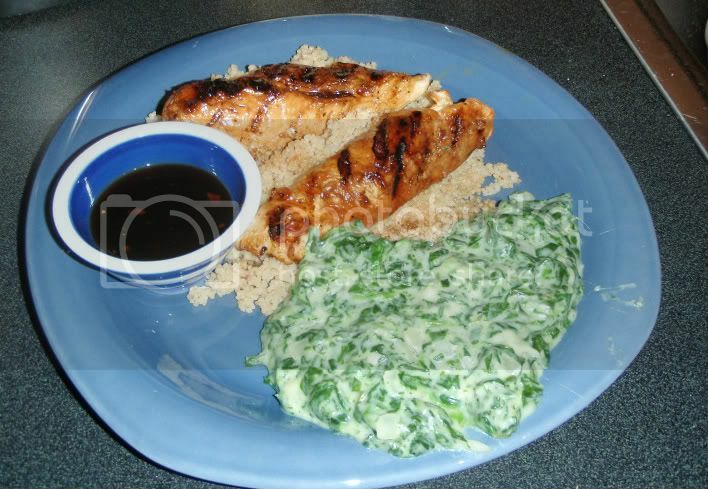 Having already grilled the flank steak with roasted parmesan potatoes the night before, I opted for simple grilled chicken breasts with couscous. As I was waiting for the chicken to defrost, I started thumbing through the Our Best Bites cookbook, which is quite a nice basic cookbook. 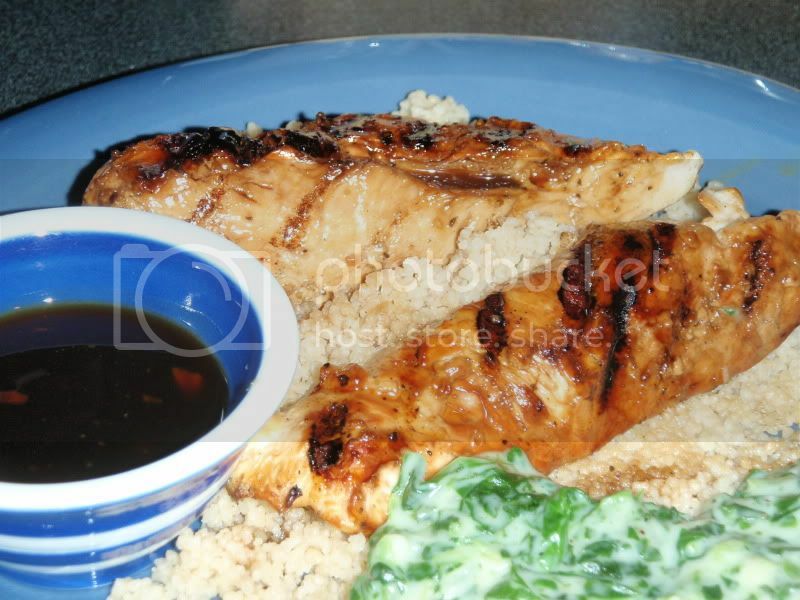 In it was a very simple recipe for teriyaki sauce. Ta-da, dinner! Both recipes whipped up very simply with minimal prep-work. I made the creamed spinach exactly except I used frozen spinach and added a handful of parmesan cheese. Quite yummy. As for the teriyaki sauce, I was missing the powdered ginger so I added a pinch of crushed red pepper. The end result was tasty, but a trifle sweet, so when I make it again, I will cut the amount of sugar by a third to a half. Bring sugar, soy sauce, vinegar, and spices in a saucepan over medium high heat to a boil until sugar is completely dissolved. Meanwhile, combine cornstarch and cold water with a whisk. Stir into sauce once you've got a full boil. Lower heat and cook until thickened. Use as a marinade, brush sauce for grilling, or dipping sauce. Melt 1 stick of butter in a pot. Sprinkle in flour and whisk together. Cook over medium heat for five minutes or until light golden brown. Add onion and garlic and stir together, cooking for another minute. (Note: The next time I try this recipe, I may saute the onion and garlic first.) Pour in milk, whisking constantly, and cook for another five minutes until a thick sauce has formed. Stir in spinach and nutmeg. 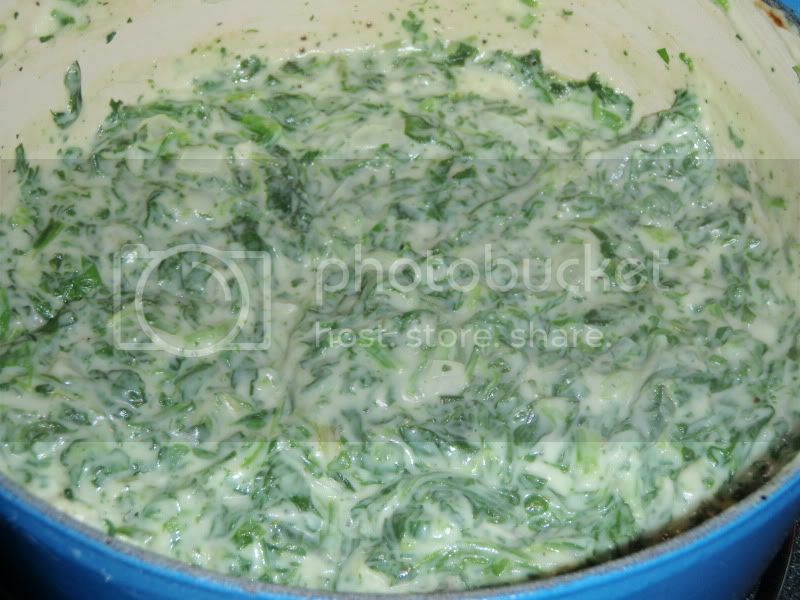 (If spinach is raw, cook in 3 tbs of butter until wilted. If frozen, cook in microwave with a few tbs of water, then drain thoroughly before adding). Melt in cheese.